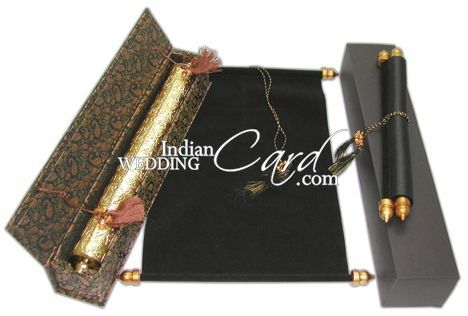 S330, Black Color, Scroll Invitations, Jewish Invitations, Fabric Scrolls. Another beautiful creation! 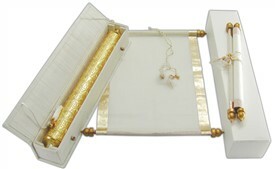 This square shaped box in cardboard with outer finish in raw silk cloth gives this card its elegant look. 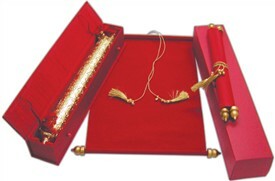 The Golden cylindrical tube placed inside the box holds the matching wooly scroll. 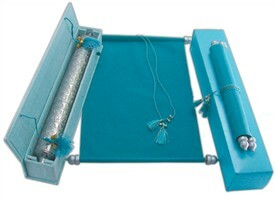 2 matching tassels tied with wooden beads close the box. The mailing box holds everything.